How not to do Social Media – Orangutans 1-0 Nestle. Latest victim of the “how not to do social media” is Nestle. In case you missed it FaceBook’s Nestle Fan page has been swamped by critics voicing concern over palm oil use, deforestation, orang utan’s lost habitat etc. Nestles response was a lesson in poor social media relations. The social attack was most likely kick-started by via a Greenpeace campaign that highlighted Nestle’s use of palm oil in its chocolate products. Nevertheless, some fans on the Nestle site responded by editing the Nestle logo for their own identity. Rather than turning this into a positive, and perhaps responding by quickly staging a competition for the most creative edited logo, they responded aggressively, defensively and rudely. The Nestle response then fuelled pages of disgruntled “fan” comments. Clearly the quick fire response gave the corporation no time to consider how best to manage. A few hours of research could have informed this person on some alternative responses. Turning a negative into a positive would have been by far the best approach. Every Nestle executive should be aware about the growing world concern over the consumption of Palm Oil. Acres of rainforest are being lost each day, as companies, cut, slash and burn to make way for more palm oil production. This is causing a huge environmental issue in Borneo/Indonesia where it is not only changing their climate but resulting in the lose of this unique habitat for orang utans and other rare species (and people who live in these forests). 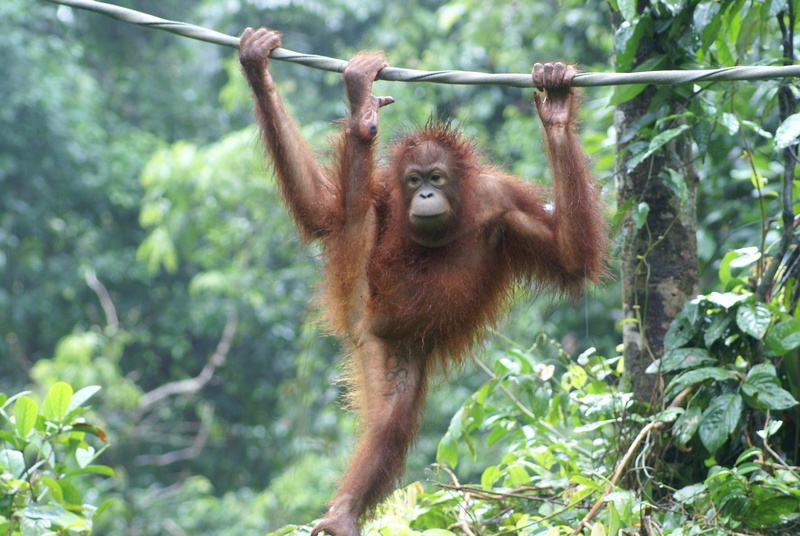 Orangutans and other animals/plants are thus facing extinction – in Sumatra it could be as soon as 2012-2015. A positive approach – such as other food manufacturers are choosing – is as follows. To stop buying palm oil and using alternatives – YES, it makes the product more expensive – consumers need to understand that. But if the majority of consumers are asking a food manufacturer to change their ingredients, it is a point of consideration which could be turned into a big positive for Nestle. corporations (example: Sainsbury’s). Palm Oil farms exist, so why not encourage those corporations to continue to grow on the SAME land and not go for the cheaper, easier option of forever using virgin land… In Australia a huge majority of school kids and parents lobbied their favourite food manufacturers to change their purchasing of palm oil. The companies listened (Nestle take note) and responded positively – a win win situation for all. This will surely become one of the main “how not to do social media” case studies for years to come – the orangutans plight may yet still win through. p.s Nestle have since made a public statement confirming that they are “taking all feasible steps to impact our suppliers to assure that we don’t buy palm oil which contributes to deforestation.” They furthermore add they will be buying from certified sustainable palm oil producers – good news??? Yes and no. They commit to do this by 2015 – it may be too late for the Sumatra orangutans who face extinction around that time. A new world? Social media protest against Nestle may have longstanding ramifications. Protest could change the palm oil industry and wake the world up to the power of ‘social media’. Information packed article on this hot topic. More background to Greenpeace’s recent action. The world’s largest user of palm oil, Unilever, has suspended its $32.6 million contract with the Indonesian group Sinar Mas after an independent audit proved that Sinar Mas is involved in the destruction of rainforest, reports Reuters. The audit was conducted early this year after a report by Greenpeace alleged that Sinar Mas was engaged in deforestation and the draining of peatlands, both of which release significant amounts of greenhouse gases into the atmosphere. Deforestation across Indonesia and Malaysia, in part for oil palm plantations, has also added pressure on many many endangered species, including orangutans, tigers, elephants, and rhinos. as very slow progress is being made with disclosure on labelling/menus. wow…i had no idea what was going on. And, Palm oil is terrible for you – it shouldn’t even be in the food we eat. Firt I would like to thank you for commenting on my discussion in Linked In regarding my blog post on Nestle. Interesting blog post you have made. I agree with the fact that because the younger generation grew with the expansion of social networks, organisations feel that the younger generation is more fit for this position. However, it does not necessarily mean that they are good at monitoring and responding in an appropriate manner when the reputation of the organisation is critical on social networks. It is important to remember that organisations on social networks can make or break their reputation very easily, and nowadays word of mouth can spread immensley, throughout the world in matter of minutes, and even seconds. Hopefully Nestle will be an example to other organisations out there promoting themselves. Thank you – glad you enjoyed.